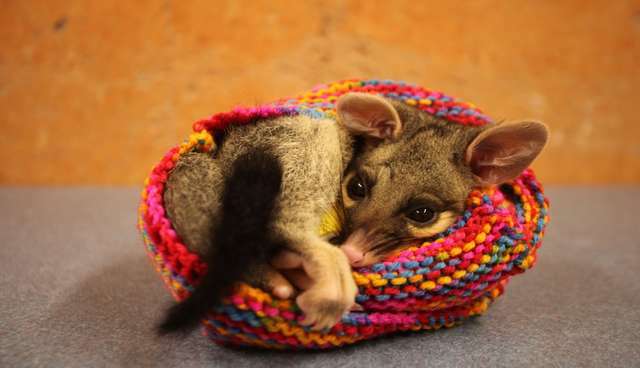 Samson, a little brush-tail possum who is recovering after being attacked by a dog, can now snuggle up in his very own knit pouch. The multicolored cozies, which were also doled out to twenty-three other tiny patients at Australia Zoo's Wildlife Hospital, "will be put to good use right away for the smallest, and often most threatened, native wildlife that are admitted to the wildlife hospital," Cynthia Thompson, director of development for the zoo's Wildlife Warriors program, said in a statement. The cozies were knit by volunteers from Unitywater. The company is part of an extended circle of compassionate knitters who regularly stitch up a storm for rescued animals worldwide. Unitywater volunteers put some elbow grease behind another animal cause last year, knitting jumpers for Phillip Island penguins impacted by an oil spill, the company said in a release. "We are so happy to think of the animals keeping warm and secure inside these little knitted pockets, which mimic their mother's pouch," said Kaye Pfeffer, a Unitywater branch administration officer. The hospital's injured, sick or orphaned wild animals appreciate the tight-knit TLC. "Something as simple as a pouch, made with love and care, can give a joey a more comfortable recovery after treatment," Thompson said. "We depend on these contributions." If you'd like to donate to Australia Zoo's Wildlife Hospital, click here.